Since 2012, European Central Bank (ECB) President Mario Draghi has done “whatever it takes” to keep the euro and the Eurozone’s economy on the road – but 2019 will usher in the next chapter in the story. The ECB stops adding to its QE scheme in December, and Draghi steps down next October. Meanwhile, the impact of Brexit will (presumably) be felt come 30 March 2019, although second-guessing how the negotiations work out and what the final deal will mean remains impossible (even assuming there is a final deal). Elections in Greece, Portugal and Finland will help advisers and clients investors to take the continent’s political temperature and judge whether populist or anti-EU (or simply anti-immigration) parties can continue to gather momentum. Interest rates are slowly creeping higher in Norway, and Sweden may not be far behind, although its overheated real-estate market is coming under duress even before policy is tightened, rather like Australia. Nervous British householders and policymakers may need to keep an eye on developments. Brexit dominates here and as this document goes to print, the potential outcome of the UK’s invocation of Article 50 and its planned withdrawal from the EU on 29 March 2019 remains entirely unclear, in terms of how it will look and what it might mean. Even if it were not for Brexit, 2019 would be a big year politically for the EU. Two nations who suffered particularly badly in the wake of the great financial crisis, and ultimately needed bail-outs from the International Monetary Fund (IMF), Portugal and Greece, both go to the polls. Both could be a key test of public satisfaction, or otherwise, with not just their own Governments but also the broader European edifice. A further election to note is the one due in Finland in April. Right wing-anti EU parties failed to grab power in France, Austria, the Netherlands or Germany in 2017 but their votes grew and Finland has its own populist, anti-EU party, the True Finns. It will be an important year for whoever wins the Finnish election. Finland takes over the revolving Presidency of the Council of the European Union in June, from Romania. Croatia and then Germany will take the mantle in 2020. One final poll to note in 2019 is the European Parliament election due to take place in late May. A decision to decrease the number of Members of the European Parliament (MEPs) to 705 from 751 means that the leading alliances will be looking to win 353 seats to earn a majority. The coming year is likely to see wholesale changes within the EU’s leadership. The current President of the European Commission is the European People’s Party’s Jean-Claude Juncker, who is already making it clear that he will not seek a second term. Investors can therefore expect plenty of horse-trading as the leading political groupings’ and countries’ powerbrokers try to bag a plum position for one of their men or women, to replace the Luxembourger Juncker, the Italians Draghi and Tajani and the Polish Tusk. Whatever investors think of European Central Bank President Mario Draghi – and his often lengthy and elliptical answers at press conference can be a source of irritation – the man himself is very clear on one point: he has done “whatever it takes” to preserve the euro and the EU and it has worked. This is because in December, the Italian will sanction a final €15-billion-a-month reduction in the ECB’s Quantitative Easing (QE) plan to taper the monthly amount of stimulus to zero. 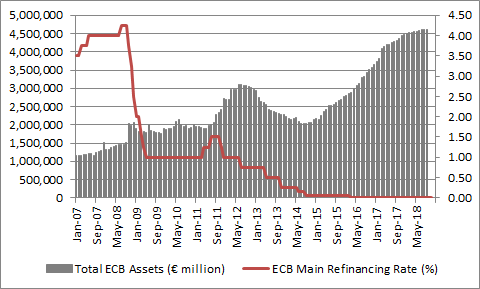 That will leave the ECB with assets of around €4.7 trillion (compared to €2.3 trillion when it embarked upon its QE plan in 2015) and no public timeline for withdrawing that stimulus, unlike the Fed which is now in the process of letting the bonds acquired mature without buying new ones. Nor, despite his apparent satisfaction with the progress made, has Draghi given any indication when the ECB’s headline policy interest rate will rise from zero, where it has been anchored since March 2016. That may be a tacit admission that there is still much to do. Unemployment is still higher than ideal at 8.2% across the Eurozone, even if this is the best figure since summer 2008. In addition, GDP growth is hardly-rip roaring, with the International Monetary Fund predicting a 2.2% rate of progress in 2019, after 1.8% in 2018, and inflation is only just reaching the ECB’s 2% target after more than €2 trillion in QE. That leaves whoever succeeds Draghi, when his two-term, eight-year stint comes to an end in October 2019, with plenty to ponder, and whoever gets the job will also have to keep an eye on the EU’s banks and those in Spain and Italy in particular. 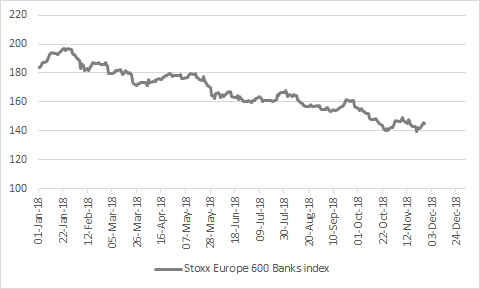 Western Europe’s banks have been terrible performers, share-price wise, in 2018 (although this is not unique to the region, as the lenders have lagged badly in the US and UK as well). Shares in Germany’s Deutsche Bank now stand at levels last seen in 1982, and Greek banks are plumbing fresh all-time lows. Bbut the Spanish and Italians may be the weakest links in the chain, since the scope for the creation of a potential ‘doom loop,’ as per 2011, is still there. According to analysis from the Bank of International Settlements, Italian Government debt represents nearly one-fifth of Italian banks’ total assets, more than 140% of the regulatory Tier 1 capital at leading lenders Unicredit, Intesa Sanpaolo and more than 200% of Monte dei Paschi di Siena’s Tier 1 reserves. It is therefore little wonder that markets get nervous when Italy’s coalition Government discusses its fiscal plans and its Budget. If vice-premiers Matteo Salvini of the Northern League and Luigi di Maio of the Five Star Movement plan anything too expansive for the EU authorities tastes, it is possible that Italian bonds will start to sell off, getting the banks into fresh trouble. Rather like every market barring the US, Western Europe found the going tougher in 2018. In total return,, sterling terms, the region looks poised to deliver its first year of losses since 2011. Thise leaves Western Europe lagging behind America and Japan. It is even trailing Eastern Europe or Latin America, to suggest investors are taking a pretty dim view of the EU’s prospects, given how tough times have been for emerging markets in 2018. The region did at least fare better than the Brexit-stressed UK, Asia and the Africa/Middle East region, although that is not necessarily saying much. When it comes to whether Western Europe can rebound in 2019, investors will be looking toward three factors in particular. The first is politics. Anti-EU parties may have failed to grab power in France, Germany and the Netherlands in 2017, and Austria in 2018, but they are in charge in Italy and part of the Finnish coalition. The Italian situation remains fluid and the Greek, Finnish and Portuguese polls could raise fresh existential questions, especially as the negotiations over Brexit could run right the way through to 29 March 2019 (or beyond?). Throw in the collapse of President Emmanuel Macron’s popularity ratings in France after barely 18 months in the job, as his plans to improve labour market flexibility continue to meet opposition, and there is scope for politics to create some market volatility. The second is just how accommodative the ECB proves to be once it tapers QE to zero and whether it starts hinting at a first interest rate increase since July 2008. Low returns on cash and low yields on bonds may also be helping to drive advisers and clientsinvestors toward stocks – just as has happened in the UK, US and Japan, too. 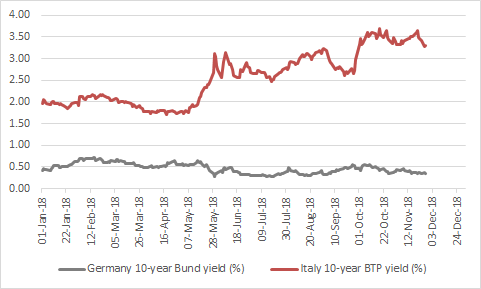 Western Europe’s 3.4% prospective dividend yield looks pretty good compared to cash yielding zero, German 10-year bunds yielding 0.51% and Italian 10-year BTPs yielding at 2.78%, although the additional capital risk must be taken into account. The third is valuation. 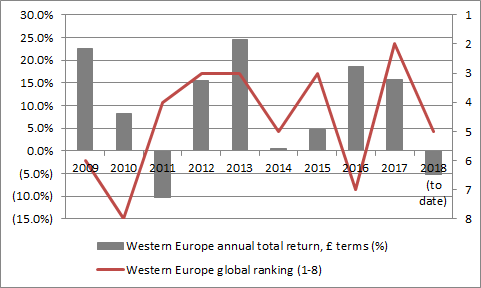 Profit momentum has generally been good over the past two to three years and consensus estimates are looking for a further 9% increase in Western European earnings in 2019. But September’s profit warning from German car maker BMW raised several issues here, notably the resilient euro and trade headwinds, although the cost increases relating to the new WLTP emissions standard were largely industry-specific (and self-inflicted after the 2015 scandal at Volkswagen). At least this year’s turgid performance from the Stoxx Europe 600 prices in some of the risks. Estimates from Morgan Stanley put Europe on 12.5 times forward earnings, against a five-year average of 14.5 times, so it is possible to argue that Western European markets offer a bit of value. 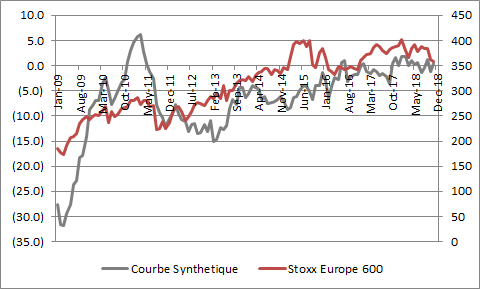 Besides the ECB policy machinations, advisers and clientsinvestors should also keep an eye on Belgian industrial confidence indicator the Courbe Synthétique, as it has been an uncannily useful guide to the fortunes of the Euro Stoxx 600 benchmark. Quite why the views of 6,000 Belgian industrialists provides such a keen insight into Europe’s equity market and economic fortunes may itself be a matter for debate on another occasion, but the results are hard to deny. The results of the business sentiment survey are released on the National Bank of Belgium’s website on around the twenty-first of each month and they can provide a succinct insight into Europe’s business fortunes. Bulls of Western Europe may therefore be pleased to see the Courbe Synthétique rally to 0.4 in November after a summer and autumn swoon. Bears will counter by noting the indicator is no higher now than it was in May 2011, when the Stoxx 600 Europe index was nearly a quarter lower than at the time of writing. This suggests that the big test for Western Europe’s economies and financial markets will come if and when the ECB starts to raise rates and withdraw QE – although the US has surprised many owing toby the progress it has made on both fronts as the Federal Reserve has tightened policy very, very slowly.